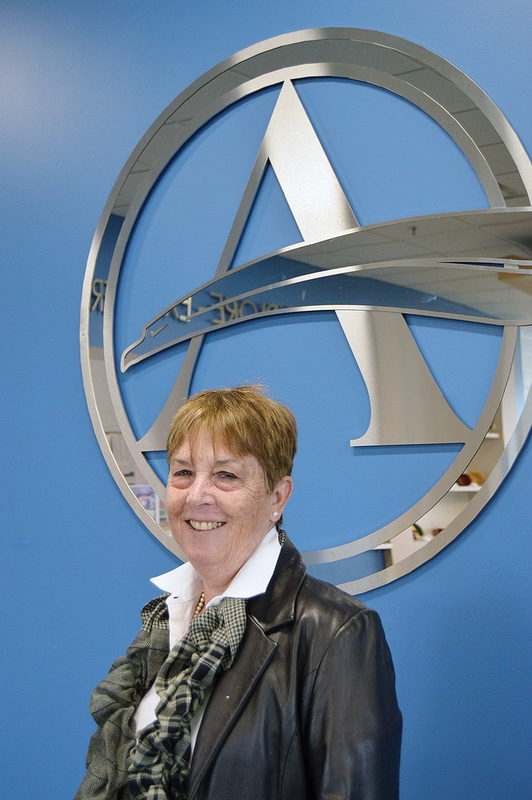 Patricia Oliphant stands in front of the Sussex Academy logo, representing a school which she helped along since its early days. That is exactly what led Oliphant to Sussex Academy some 16 years ago. After two years leading the Delaware State Education Association’s professional development program, she said, she was ready for a new challenge. When she first began talking to officials at Sussex Academy — then, a brand-new school in Georgetown — she told them, “I don’t really know anything about charter schools, but I know how to teach English.” Indeed, Oliphant had started her career in 1967 as a high school English teacher. In the intervening years, Oliphant taught and worked in administration in the Indian River and Woodbridge school districts, including stints as principal of Woodbridge Senior High School and director of curriculum for IRSD. In the end, she took on executive director duties at Sussex Academy — then, a middle school encompassing grades six through eight — sharing administrative duties with Allen Stafford for most of that time. “Allen and I have had what I consider a wonderful collaborative relationship,” Oliphant said. The two shepherded the new school through its early years, its move into the former Delmarva Christian School location, the addition of a high school, and construction of a new middle school wing and a state-of-the-art aquatics facility. Last year, Oliphant saw the graduation of the first class of Sussex Academy’s high school. She also oversaw the school’s application for renewal of its charter, and the subsequent approval of the first 10-year charter ever awarded in Delaware. Although she had considered retiring earlier, Oliphant said she decided to wait until after the charter renewal process. That new person, as it turns out, will be Eric Anderson, currently vice president at the Charter School of Wilmington, who will take over as executive director at Sussex Academy on July 1. Oliphant, who started her career at what was then the K-12 Millsboro School in 1967, marvels at the arc of her career and the changes she has seen in society and in education. “I started the first year of full integration,” she said. “I saw the beginning of integration, the end of segregation and the beginning of consolidation,” she added, referring to the formation of what is now the Indian River School District. While she said she believes those experiences shaped her career, she rattles off a long list of family members and educators when asked who influenced her the most throughout her life. She begins with her father, Paul F. Schumacher, and her mother, Rose Schumacher. She summed up her parents’ influence in four words: “My father, passion and presence. My mother, her patience and persistence. Through it all, one principle has guided her path, Oliphant said. She said she understands not only that a good teacher can change the course of a child’s life, but that a bad teacher “can set a kid back two or three years… and that’s research-driven,” Oliphant said. Former IRSD superintendent James M. Proudfoot gave her advice that has stuck with her over the years, she said. Her relationships with teachers over the years have enriched her life in various ways — from her days as a classroom teacher to recent years as an administrator. “It’s because of the teachers in this school that we have been able to progress and achieve what we’ve been able to achieve,” she said. As for what makes a good teacher, Oliphant said, first and foremost, “A good teacher has to have a pretty strong grasp of the content that he or she is teaching. A good teacher is able to blend the academic content that he or she is teaching with authentic experiences and reasons why kids need to understand that content. “Teaching is part science and part art,” Oliphant said. One of the first teachers Oliphant got to know was Susan Bunting, now Delaware’s Secretary of Education. In a recent phone interview from her Dover office, Bunting heaped praise on her old friend, colleague and boss. “I could talk about Patricia Oliphant for hours,” Bunting said. She said she has had some tough conversations with parents over the years, even heartbreaking ones. “But you also get the joyous experiences about somebody getting into college or winning a swim meet or being the champion or getting an honor somewhere. There are a whole lot more highs than lows,” she said. “God, have I been blessed? I have been blessed,” Oliphant said, with tears in her eyes, “because people have given me the opportunity to explore education in numerous capacities. It’s been a journey of love and a journey of my heart.